BRADENTON, Fla. (AP) Some Pittsburgh Pirates were upset when Jeff Branson was fired at the end of last season after six years with the team. It helps that new hitting coach Rick Eckstein is off to a smooth start in spring training. "I like him a lot," right fielder Gregory Polanco said. "He knows a lot about hitting but he explains what he's thinking to you in a way that's easy to understand. I think he's really going to help our whole team." The Pirates' offense was 19th in the major leagues last season with an average of 4.3 runs a game and 25th with 157 home runs. 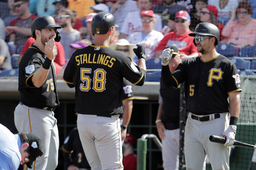 Manager Clint Hurdle believes by using a blend of analytics and video technology that Eckstein and new assistant hitting coach Jacob Cruz can squeeze more out of the offense in 2019. "I think we've really put two new men for us into place that have their finger on the pulse of the offensive game," said Hurdle, who was a hitting coach with the Colorado Rockies and Texas Rangers. "They're more proactive than reactive. Sometimes you don't get results and a new voice can have an impact. "The research both of these guys did as we went through the interview process, the experience they've had with analytics, with new technology, with new ways to measure, with new ways to instruct, with new ways to teach, it all just seemed like the perfect combination for us." Eckstein spent the last two years as the Minnesota Twins' minor league hitting coordinator. He was the Washington Nationals' hitting coach from 2008-13. Eckstein is spending this spring learning the hitters' strengths and weaknesses. He is tailoring individual plans to each player rather than trying to make them adhere to one philosophy. "That's where our head is, as far as taking this thing forward," Eckstein said. "We're tapping into each guy to reach more of their potential and play as a unit where we're all on the same page." The older brother of David Eckstein, the MVP of the 2006 World Series while playing for the St. Louis Cardinals, is a proponent of technology. However, he believes communicating with the hitters is paramount. "Our focus is a little bit more on a ground-floor level of timing and positioning and understanding that there are certain areas of the hitting area that we need to be really good," Eckstein said. "There's a difference between the strike zone and the hitting area, and within that there are contact points that are optimal contact points, and there are contact points that are sub-optimal. "If we understand that everybody has a downward plane of their swing and everybody has an upward plane of their swing, where does that play for you?" NOTES: INF/OF Alfredo Reyes was moved from the minor league camp to the major league camp Saturday as a non-roster invitee. He played at three levels of the minors last season, finishing at Triple-A Indianapolis. . The Pirates continue to list C Elias Diaz as week to week because of a virus. The team hasn't provided any further details.